Span Tech's continuous curving, sanitary, food-quality plastic chain conveyor systems are versatile, modular, and capable of horizontal and vertical bends within one chain design. They can be combined and configured for near infinite possibilities. These conveyors are utilized in food production and handling, manufacturing, packaging, distribution, pharmaceutical applications, and more. Straight plastic chain conveyors excellent for packaged item transport, assembly, or traditional belt conveyor applications. Fully assembled bed sections with detached legs for easier shipping and assembly. 13 belt widths and 4 belt types available. A modular design with flexibility in turning radius and straight lengths. Customize designs with 3 turning radius options and varying overall straight lengths projecting from the curve. Ideal for order fulfillment, carton transport, or end-to-end-transfers. 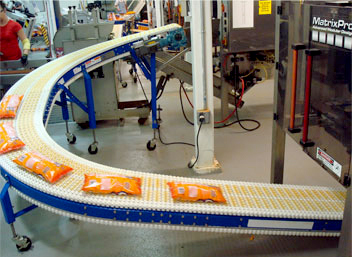 CV-Series curving plastic belt conveyors are ideal for applications where you must turn corners in limited floor space. CV series offers single curves with minimum end lengths, engineered for the tightest possible turning radius. A dual-curve conveyor that features two curves creating a "horseshoe" bend, allowing custom designs to fit in tight spaces and in various conveyor layouts. Configurable straight lengths between curve and end of conveyor add layout flexibility. Horizontal offset curve conveyor that features 2 opposing curves where entrance and exit straight sections are parallel. Features variable straight section lengths between curves, and curves and conveyor end. Specify curve angles for maximum flow control. An inclining or declining conveyor with custom lengths available. This series is offered with a straight bed section elevated at a continuous angle. These conveyors allow change in the elevation of various products. 6 belt types offered for specific tasks. Vertical offset plastic chain conveyor with horizontally oriented sections at the start and end of the conveyor. Both vertical curve angles can be specified for various applications. Maximize flexibility with optional center sections between the two curves. Options such as guard rails, speed controllers, transfers, and more to help enhance the functionality of your conveyor system. Span Tech's patented chain designs offer the most durable solutions in the business. Signature MultiSpan, MaxiSpan and MonoSpan chain types fit many applications to eliminate the inconsistencies in your conveyor line. Conveyor chain: white, acetal plastic with stainless steel hinge rods for long service life. Bearings are lubricated SpanLon bushings, internal to the conveyor frame. Chains can be taken apart at any link for ease of maintenance. Conveyor legs feature steel flange foot construction for stable floor anchoring.